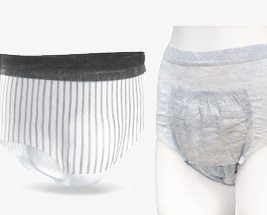 Our range of Disposable Incontinence Pants for Men are suitable for high levels of absorbency whilst being discreet and a comfortable option. The products are suitable for different levels of incontinence to suit your needs and provide maximum protection. All of the products have a wetness indicator and can be torn at the sides for convenient removal. If you require a product that is suitable for heavier levels of incontinence then please review our range of Men's Washable Pants.